A SPECIAL TRAIN for the Governor of Nyasaland. The railways under his jurisdiction have 273 miles of 3 ft 6 in gauge track. THERE are few railway systems more interesting than that which connects Lake Nyasa with the growing port of Beira in Portuguese East Africa. 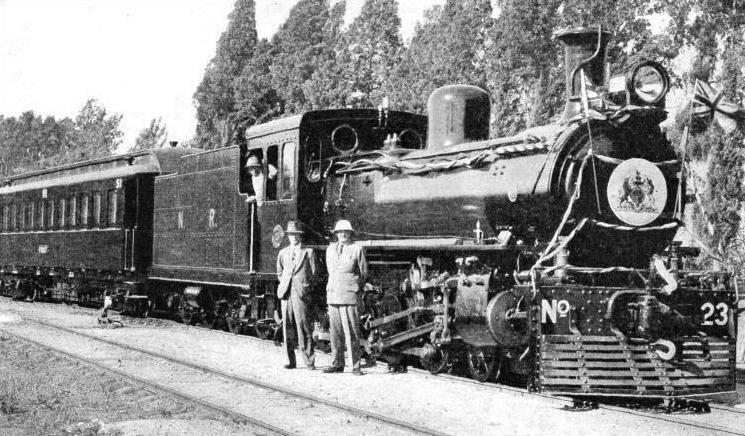 This system, completed in 1935, is composed of the Nyasaland Railways, the Central Africa Railway, and the Trans-Zambesia Railway, and links with the Beira Railway at Dondo Junction, eighteen miles north-west of Beira. The length of the system is about 500 miles. It has been built at intervals; the middle section was opened in 1908. The need to suppress the slave trade, the vagaries of a changing river, war, and the development of what had once been unknown territory, each played a part in a romance of modern transport that has led to the building of the Lower Zambesi Bridge, the longest railway bridge in the world. The Lower Zambesi Bridge is described in the chapter, “Over River and Lake”, beginning on page 702. The Nyasaland Protectorate is a strip of land about 520 miles in length, varying from fifty to a hundred miles in breadth, the area being about 40,000 square miles, or about one-third that of the British Isles. The chief towns are Blantyre, with about 300 European and 73,650 native inhabitants; Limbe, near Blantyre; and Zomba, the seat of the Government, to the north-east of Blantyre. Jasper Bocarro, a Portuguese, is said to have been the first European to set eyes on what is now Nyasaland, travelling in the country early in the seventeenth century; but authentic history begins with Dr. Livingstone. That indefatigable explorer ascended the River Shire, discovered Lakes Chilwa and Pamalombe, and reached the southern shore of Lake Nyasa in September, 1859. Lake Nyasa, the third largest lake in Africa, is 360 miles long, ten to fifty miles wide, and has an area of 14,200 square miles. Its greatest depth is 386 fathoms, and it lies 1,555 ft above sea-level. Missions were founded in the country by the Universities of Oxford and Cambridge and by the Free Church of Scotland. Early pioneers were impressed by the climate, for, since much of the country stands at an altitude of 3,000 ft or more, the heat is not generally excessive. The European population is not large, however, being 1,817, while the natives numbered 1,608,023, and Asiatics, 1,474 at the last census. Arab slave traders used to cross Lake Nyasa on their way to and from the coast, and the opposition of the early European settlers led to a conflict with the Arabs who had settled at the northern end of the lake. The first settlers hoped to find a navigable waterway from the coast to the lake. The country could be entered at Chinde on the delta of the Zambesi in Portuguese Territory, and the river could be navigated to its confluence with the Shire River, up which shallow-draught stern-wheel steamboats proceeded to Port Herald. When the River Shire was in flood, boats were able to proceed a fair distance above Port Herald. All hope of getting to Lake Nyasa was stopped by the obstacle of the Murchison Falls, which connect the Upper and Lower Shire rivers, during their progress from the lake to the Zambesi. STEEL AND CONCRETE. Two of the large spans of the Lintipe Bridge, which carries the track of the Nyasaland Railways across a wide river. The bridge is on the 160 miles stretch between Blantyre and Salima, the present terminus of the railway. The young settlement was thus cut off from effective transport with the sea and the outside world. Expansion was hindered. The British Central Africa Company decided at the beginning of the twentieth century to build a railway between Blantyre and Port Herald. The line would not only lower the cost of transport, but would also provide a means of breaking up the slave trade around the lake. The length of the railway was only 113 miles, but a difference in level of 3,700 ft had to be conquered. The broken character of the country added to the difficulties, as rifts in the hills, dry in summer, became raging torrents in the wet season. The struggle with the Shire River started at the very beginning, as the first plan was to connect Blantyre by a line only eighty-four miles long to the river at Chiromo; but access by water to Chiromo proved too uncertain. Because of the varying depths of water and changing sand-banks vessels were constantly being stranded, and the idea of using Chiromo as a river port had to be dropped; Port Herald, some thirty miles farther south, was substituted. Railways in undeveloped countries generally begin at the coast, but this one was different. Every scrap of material had to be shipped out from England to Beira, transhipped into coasting vessels for transport to Chinde, where it was loaded in shallow-draught river boats and taken to Port Herald. The country was in such a primitive state that nothing could be obtained locally - not even unskilled labour - as at that time agents from the Transvaal had received permission to recruit native labour in Nyasaland to aid the British forces in the Boer War. The railway builders thought of importing coolies from India, but this suggestion was vetoed by the Government. With a view to speed and cheapness in construction, and because of the expected lightness of the traffic, the company had planned a narrow gauge, but the Government authorities in London insisted upon the South African standard gauge of 3 ft 6-in. Although this insistence was far-sighted, it added to the troubles of the men on the spot. The 41¼ lb rails were therefore laid at this width on steel sleepers, as the use of timber would have merely provided the ants and beetles with an unexpected meal. No coal and no lime were to be obtained locally at that time, and bricks could not be made to help in the erection of the piers. There was no stone good enough to be used as masonry. Portland cement, imported from England to make concrete, cost five or six times the original price by the time it reached the site, because of the cost of transport. But careful organization and rigid attention to every detail ensured success, and the material reached Port Herald; natives were even-tually recruited and work began. An incident in the beginning throws light on the strange problems that the railway pioneer has to solve in a primitive country. In addition to the hills, rivers, floods, heat, insects, and sickness, he has to contend with the psychology of the natives coaxed to build the track. Before the railway began there was no money in circulation among the natives, who, in fact, did not know what money was, as there was no coinage. But they knew what cloth was, and this was the recognized currency. The Government, however, refused to allow the natives to be paid in cloth, so the labourers had to be taught the value of money. ON THE TRANS-ZAMBESIA RAILWAY. A “Beyer-Garratt” locomotive with a total weight, in working order, of 99½ tons and a boiler pressure of 180 lb per sq in. The cylinders measure 15-in, by 22-in and the diameter of the coupled wheels is 3 ft 6¾-in, while the tractive effort at 85 per cent boiler pressure is 35,430 lb. Engines of this type were delivered for service between Beira and Murraga. The line followed a northerly course from Port Herald roughly parallel with the River Shire as far as Chiromo. It then crossed the river by a, bridge about 420 ft in length to reach the valley of the Ruo River. This bridge, a fine piece of construction, was another example of what makes railway pioneers philosophers when caught between the upper millstone of a Government order and the nether millstone of a river with the diabolical tricks of the Shire. Although the attempt at establishing the base of the railway had been foiled because of the unsuitability of the river for navigation, the Government stipulated that the railway bridge should not interfere with navigation. Since the railway was built the river has been very little used. The Government demanded, however, that the proposed bridge should have an opening 100 ft wide, giving a head clearance of 30 ft at high water. The ordinary drawbridge or swing-bridge was out of the question, as the heavy expense would not be justified because of the infrequency of the river traffic, and when the occasion arose the time needed to open the bridge would not be of great importance. The engineers designed a lifting span of interesting design. They realized that it would have to be simple and easily operated by hand, as natives would have to be employed to open and close the bridge. On the top of each of the two piers carrying the lifting span they erected a tower, with two single vertical racks on each to act as a guide. A platform was built on the top of the tower with a large sprocket wheel at either end. A chain passed over each sprocket wheel, one end being made fast to a corner of the lifting span, and the other to a counterweight. To open the bridge the natives wound a winch which turned the sprocket wheel. As the counterweight descended the lifting span rose up the racks on either tower until it was at the top. When it was in this position the counterweights on the out-side of either tower lay across the metals, forming a barrier to prevent anyone from trying to cross the bridge when the span was raised to the open position, for vessels to pass. As the weights balanced that of the span, the only effort required was to overcome the friction of the moving parts. The principle was that of a sash window, the weights corresponding to sash weights. The span weighed fifty-five tons. Eight men, under a native foreman, worked the winches, the operation of raising and lowering the span taking about half an hour. This ingenious structure was shipped out from Great Britain and was erected; but directly it was in position the River Shire changed its course, so that the navigable channel shifted from under the lifting span to under a fixed span. The lifting span was thus a waste of time, money and effort, as it was never used. 4-8-0 LOCOMOTIVES built by the North British Locomotive Co, Ltd, of Glasgow, are used on the Nyasaland Railways. These engines have a total heating surface of 1,181 sq ft, a grate area of 17½ sq ft, a tank capacity of 3,500 gallons, and weigh in working order 89 tons. Some twelve miles north of Chiro mo the line begins a stiff climb through broken country to reach the plateau, at an altitude of 4,000 ft. The ruling gradient is 1 in 44, and the minimum curve of 363-ft radius. Because of the winding valley the line is a series of curves winding round crags and bluffs. Here and there wide clefts in the mountain sides are spanned by bridges, which are supported on steel towers. The towers are carried on concrete pedestals. One of these bridges, spanning the M’Swadzi River, is 290 ft long. The valley of the Ruo is left after the sixty-fourth mile, and the line makes a difficult, winding ascent along the Tuchili River for nearly ten miles. The track then crosses over to the Luchenza River, which it follows until the summit level is reached, 109 miles from Port Herald. In the next five miles the line descends 500 ft to gain Blantyre, originally the northern terminus. COMPLETED IN 1935. This map shows a system covering some 500 miles, which includes the Nyasaland Railways, the Central Africa Railway and the Trans-Zambesia Railway linking Lake Nyasa with the important port of Beira. A 3 ft 6-in gauge has been laid. The line took about seven years to build. The natives proved poor workmen. They dodged work as much as possible, and when the rainy season, which lasts about three months, set in, they deserted the line to cultivate patches of land, and did not return until the rains were over. At that time, when the science of tropical medicine was far from its present standard, the mortality among the Europeans was severe. On this account the repair shops and administration offices were established at the summit level, Limbe, five miles from Blantyre, one of the healthiest places in the country. This Shire Highlands Railway, as it was originally called, was opened to traffic in 1908, and soon after this the Shire River again set the engineers a problem by falling considerably, until at last navigation by river to Port Herald became so difficult that the building of a railway south from the terminus to Chindio had to be considered. A line, sixty-one miles long, to be called the Central Africa Railway, was projected. Chindio, on the north bank of the Zambesi, was selected, so that passengers and goods arriving at Beira could be transferred to coastal steamers and taken to Chinde, at the mouth of the Zambesi, and thence by river steamer or launch to Chindio. 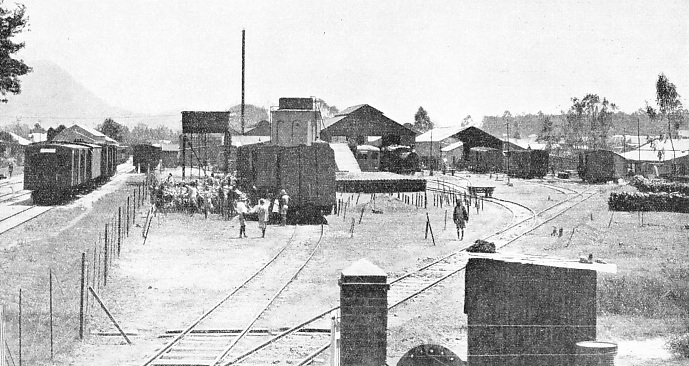 When the war of 1914-18 broke out the need for this railway became imperative, because it was a vital link in the camp-aign against the German forces in East Africa. A British column was operating in Nyasaland, and, to enable supplies to be adequate instead of being hampered by the Shire River’s uncertainties, the new line was pushed forward. It was completed in 1915. The northern section of the east shore of Lake Nyasa, now part of Tanganyika Territory, was then German East Africa. At the outbreak of the war a British force crossed the lake to Sphinxhaven, disabled a German steamer there while she was on the stocks, and thus secured command of the lake. In May, 1915, having heard that the vessel was being repaired, a British naval detachment crossed the lake, disabled the ship again and captured stores and ammunition. 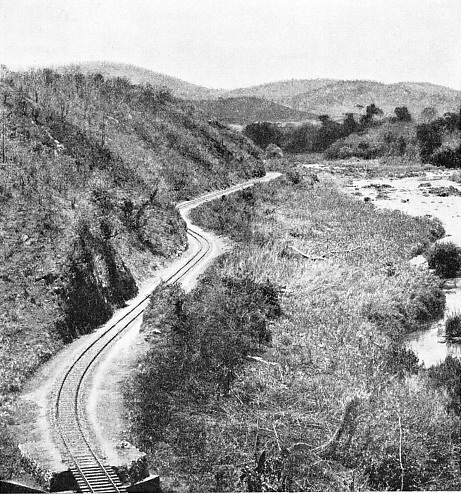 The photograph shows a section of the railway in Nyasaland, which follows a tortuous course through the valley of the River Ruo, north of Chiromo. After the war the need for connecting the Zambesi Valley with Beira by rail, both to develop the Mozambique Company’s territory in Portuguese East Africa, and to improve communication with Nyasaland, resulted in the building of the Trans-Zambesia Railway; and the line from Dondo Junction to Murraca, opposite Chindio, was opened in 1922. This line is 156 miles long, the distance from Beira being 174 miles. 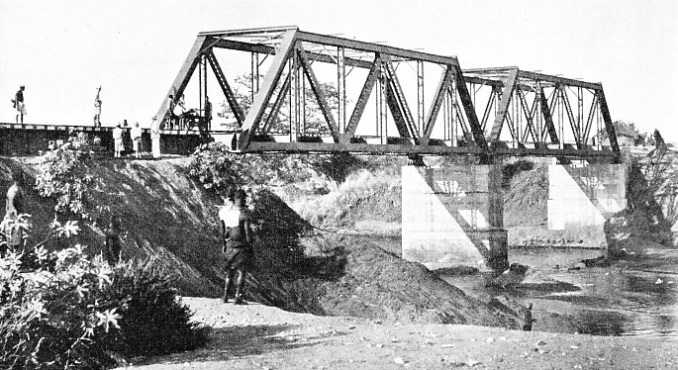 Before the Trans-Zambesia Railway was opened the journey by water from Beira to Chindio sometimes took as long as a fortnight, but the opening of the new railway reduced the time to rather less than twenty-four hours. Passengers slept on the train. The trains were run twice a week in either direction, from Beira on Mondays and Fridays, and from Blantyre on Sundays and Thursdays. As far back as 1894 a railway was projected, a survey was made for the Trans-Zambesia Railway, and the Portuguese granted a concession to the British. The line, though running on Portuguese soil, is owned by a British company, and is another example of the successful co-operation of British and Portuguese in this part of the world. The carrying of the line from Murraca to Sena, for the new bridge, meant building an extension of twenty-five miles through a country subjected to floods. The extension has been built on an embankment, the height of the track being from 11 ft to 20 ft above the ground line, the embankment having a special cross-section to enable it to withstand floods. For three-quarters of the distance from Murraca the embankment is built with a wide base without openings to form a river wall protecting the country from floods. It is riveted with stone to protect it from the strong flood currents, and the track is more than 3 ft above the highest recorded flood level. The other quarter of the distance contains numerous bridges, and culverts to allow flood water from behind the track to flow into the Zambesi. This work was included in the bridge contract. The annual average of goods traffic for the five years ended 1933 was 85,871 tons. In 1930, a record year, 22,260 passengers were carried. When the bridge at Sena was opened - the regular service of trains began on March 1, 1935 - the old track on the northern bank became obsolete. The section between Chindio and Bawe was dismantled, and the twenty-four miles length of track thus recovered was sent north to be used in extending the railway from Blantyre to Lake Nyasa. The whole length of line from Beira has at present only one short railway feeder, a 3 ft gauge track belonging to the Sena Sugar Estates which connects a sugar factory at Marromeu on the Zambesi with the Trans-Zambesia line at Caia Station. The northern extension from Blantyre to Lake Nyasa is 160 miles in length, and terminates at Salima. There is a short branch to Chipoka Quay, on the shore of the lake. The original intention to make Domira Bay, on the shore of the lake north of Salima, the terminus, was checked by the action of Lake Nyasa in rising to an unusually high level. The line is the only railway that reaches Lake Nyasa, and the only railway connexion from the lake to the sea. THE DEPOT OF NYASALAND RAILWAYS AT LIMBE, on the main line between Port Herald and Blantyre. The railways possess at present twelve locomotives, two “Sentinel Cammell” rail-cars, eighteen carriages, and eighty-four wagons. Northward from Blantyre the first twenty miles of the new line passes through hilly country, the ruling gradient being 1 in 80, but the remainder of the distance is easier. The importance of the terminus lies in the fact that Salima is connected by road with the tobacco-growing districts round Lilongwe and Fort Jameson, the latter in North-Eastern Rhodesia. Both these districts are thus brought within reach of the railway running direct to the port of Beira. Nyasaland, with Northern and Southern Rhodesia, is the most important source of tobacco in the British Empire, and the value of Nyasaland’s tobacco exports is seventy per cent of her total exports. Other crops are maize rice, cotton, tea, coffee, and sisal. The country is entirely agricultural, no minerals of commercial value having yet been discovered. The new railway development will open up an area of fertile lands by providing cheap transport, especially around Lake Nyasa. One of the first big transport jobs on the new line was the hauling up to the lake from Beira of a Diesel-engined vessel, 100 ft long. The ship was in sections, and these were put together on the shore of the lake. The vessel can carry about 350 tons of cargo, and as the arrival of the railway has increased the traffic on the lake, this little ship - which is owned by the railway - will form a valuable addition to the existing water-transport, and act as a feeder to the railway. When the northern extension was constructed 112 of the 160 miles from Blantyre to Salima were built in a year. The principal bridge is the Lintipe Bridge, which has two spans of 100 ft and four spans of 50 ft, but there are three hundred minor bridges and culverts. The line from Blantyre to Mile 30 was ballasted with weathered rock excavated from cuttings. Coarse sand from river beds was used for the next thirty miles, for a further thirty miles good ballast was obtained from a quarry, and thereafter coarse river sand was used. There was no shortage of water. At one point a rainfall of over four inches in less than two hours was registered, while at another the track was flooded for several days. Near the Livilezi River the overflow from a point a thousand feet above the track damaged the bank. The northern extension has made hunting grounds easily accessible for big game hunters in quest of elephants, buffaloes, and hippopotami. All equipment is on sale at Blantyre; but the hunter has to make a road trip of some forty miles to Zomba, the headquarters of the Administration, which is not on the railway, to obtain his game licence. The equipment of the railways is up-to-date. Practically all the 41¼ lb rails have been replaced by 60 lb rails. The loco-motives and rolling-stock are adequate. The Nyasaland Railways possess twelve locomotives, two “Sentinel Cammell” rail-cars, eighteen carriages, and eighty-four wagons. The Trans-Zambesia Railway has nine locomotives, a private saloon, nineteen carriages, 135 wagons and three travelling cranes. Each company has a motor trolley. The D class locomotives have the 4-8-0 wheel arrangement. The total heating surface is 1,181 sq ft, grate area 17½ sq ft, tank capacity 3,500 gallons, bunker capacity 7 tons of coal, and weight in working order 89 tons. The E class “Garratt” engines have the 2-6-2 + 2-6-2 wheel arrangement, and the weight in working order is 99½ tons. Total heating surface is 1,687 sq ft, grate area 33.9 sq ft, tank capacity 3,500 gallons, bunker capacity 4 tons of coal. Each railway has a combined kitchen and brake van, which is 60 ft in length, and is designed to carry 20 tons, the tare weight being over 34 tons. It is equipped with a coal-fired cooking range, a water supply and a sink. The “Sentinel” steam rail-cars, of 120-125 horse-power, were introduced into Nyasaland in 1933 for Hindoos and Africans. Since the fares on the rail-car are lower than those on ordinary trains, the natives have been induced to travel more frequently, and labour is becoming rather more fluid in the Protectorate. It has also been possible to reduce the number of mixed trains which carried passengers and goods, now that the natives use the rail-cars. Track maintenance presents problems unknown in temperate climates. In addition to the usual troubles, due to torrential rain in the hills and floods which damage earthworks, the railway has locusts to contend with. On one occasion the loads of goods trains in one section had to be reduced for a period of several weeks, as the crushed bodies of the insects caused the wheels to slip. As we have seen, the railway in this section of Africa has developed partly because of the vagaries of the Shire River, which caused the pioneers to build a reliable, cheap means of transport as the only way to open up a country of great possibilities. It is significant that a country inhabited by fewer than 2,000 white people is now served by a system of lines consisting (including the Trans-Zambesia) of some 500 miles. The Protectorate is the land of men with ideas and men of courage, as this chapter has shown. A STATION IN THE TROPICS. Balaka, a halt on the lines of the Nyasaland Railways is seen here. The roof above the “platform” is thatched. You can read more on “Across Africa by Rail”, “In the Nile Valley” and “Progress in Rhodesia” on this website.